Hunter is a small domestic cross breed. He came to us as a stray in October 2011 so we are not sure of his age – he is fully matured but we think he is probably less than 2 years old. He is easy to handle and shows all the signs of being a lovely pet. 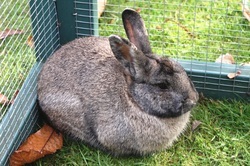 He is due to be neutered at the beginning of November and so he will be ready for a new home at the end of November.